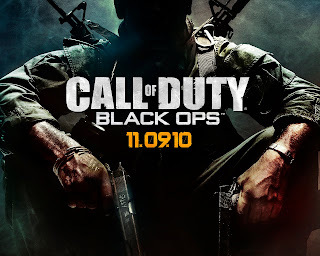 ...That's What She Said: Coming soon--info on Call of Duty: Black Ops! Coming soon--info on Call of Duty: Black Ops! So, on Friday, May 21 I got the chance to go to Treyarch to preview the new Call of Duty: Black Ops. There were quite a few of us there, all of the rest of them were guys. This really isn't surprising to me and I must admit they didn't treat me any differently because I was a girl. I was the only girl. They were a great group of guys from all over the country with different positions in the Call of Duty community--gamers, bloggers, forum admins, etc. Then there's me. Again, the only girl. I felt special. Unfortunately, I can't talk about what we saw, not until Friday, May 28 at 9:00am EST. It's killing me! I would love to be able to go into details but unfortunately the embargo says no. It was a great experience to say the least, especially when it came to meeting the people who bring it all to the community. Those guys (and girls behind the scenes) are amazing. Please excuse the rambling as this is definitely new to me. So don't hate me, yet. And watch for Friday's post for sure! What does gender have to do with anything? Gender doesn't matter to me. I am a minority in the gaming world is all. Out of the 16 people there I was the only female. I think it's nice that a female gets to give their perspective. I'm just glad it's me. so here's a question for b4 the big drop on COD7. How come you were there? What's your connection to the community that got you in the door? Looking forward to finding out all the gossip on this game its goin to be the best one yet.